While we aspire to satisfy your requests we do not split specials featured on this page. Three buckwheat blini cakes topped with French lentil caviar, garlic, capers and lemon juice. Garnished with almond vegan cheese, paprika and fresh dill. Vegan, vegetarian, gluten free, contains nuts. AM only. Toasted multigrain bread stacked with sliced avocado, two sunny side up eggs, radishes, pickled red onions, organic arugula, goat cheese and drizzled with chimichurri sauce. Served with choice of side. Vegetarian, can be vegan, can be gluten free. Based on a recipe that Terry Kaplan used to cook for his family. Ground Shelton's turkey simmered in a red guallijo chili sauce with organic tomatoes, white navy beans, bell peppers, onions, garlic, cumin and gluten-free beer. Topped with melted cheddar cheese, onions and parsley. Served over house-made linguine. Can be gluten free. 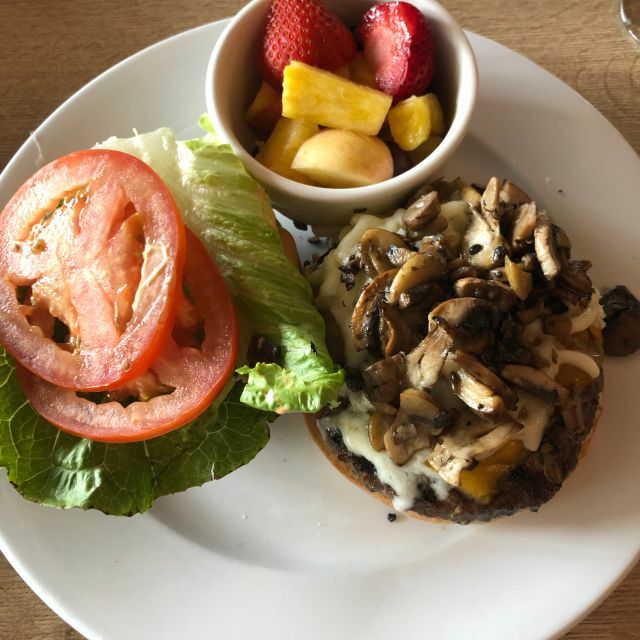 Our new veggie burger with roasted shiitake mushrooms, beets, and garbanzos. Served in a lettuce wrap with layers of house-made kimchi and special mixed greens tossed in a roasted garlic jalapeno and sesame ginger dressing. Served with choice of side. Vegan, vegetarian, gluten free. Mary's organic boneless half chicken marinated in citrus juices and spices, pan roasted and served with refried pinto beans topped with mozzarella, Arroz Colorado, corn tortillas and ranchera sauce. Garnished with cilantro and a slice of lime. Gluten free. Rich with Vitamin C, the brew of hibiscus buds is mixed with our house-made lemonade. Vegan, vegetarian, gluten free. We are so sorry that Hugo's closed it's Agoura location. The food is very good and they have lots of choices for vegetarians and people with special needs diets. Our waitress was as helpful with our requests as she could be. She went out of her way to help us and we were very grateful. Drove up from Long Beach to enjoy their Sangria—it’s the best in SoCal. Food is beyond delicious. We generally love the food at Hugo's. It's a little pricey, but the food is always good. I love Hugo's!! It's one of my favorite restaurants ever! I'm vegetarian and gluten free and there is almost nowhere else that I have so many options and can go with meat eaters and they can get satisfied as well!! It's brilliant and healthy. I was waiting for the bathroom and talking to the man in front of me. He says he comes every Sunday - that he's a nutritionist and the food there is so good and healthy!! Hugo’s is always on point. Healthy delicious hot food, good beer and wine..
Tonight it was cold and rainy so I ordered the shepherds pie with a glass of white wine. It was divine! I sat on the patio with the outdoor heaters on and watched the lightning and rain. Good service, and the ambience is always fresh clean warm, good lighting . One of the valleys finest. Have ordered holiday meals from Hugo's twice and eaten there several times in the past. This time was not up to the usual standard. Several complaints about the food from several members of our party. Waiter did not come to check on us or we would have sent one dish back. When I got there and asked if the rest of my party was already seated, I was told no and I had to wait for them to show up in order to be seated myself. Turns out they had been seated by a different host, and were waiting for me while I waited for them at the entrance. Good place with good food!!!! Food was great. Love that there’s food for my vegetarian husband and for me, who eats anything. It's ok for a diner-like experience, but the ambience leaves a lot to be desired ... think mid-eighties bland ... noisy and the food was ok, but way overpriced. Service was impeccable, however. A great selection of healthy and wonderful food. Attentive service. Love this place. They have something for everyone. I love they serve breakfast all day! THE PRICES WILL GENERALLY TAKE ME ELSEWHERE FOR AN AVERAGE LUNCH, BUT IT WAS BUSY, SO OTHERS DON'T SEEM TO MIND. The selection is impressive so we’re trying everything on the menu as we keep coming back. The fried pickles and cauliflower were really good, but the Asian spring rolls just had a grassy carrot and lettuce taste. Stephen was great though and brought us a better dressing for it (the ginger one). The inside ambience was nicer because of the candles, but we ate in the front patio this time. Just a little bland. But nonetheless, it’s great to have this place in the middle of where my daughter and I come from during the week- Burbank and Woodland Hills. So thank you and see you soon! If it were a little less expensive, I'd probably eat there every day. Everything I've ever had there is great -- lots of creative, unusual dishes. Parking can be a challenge sometimes - there is a parking lot, but it fills up quickly. 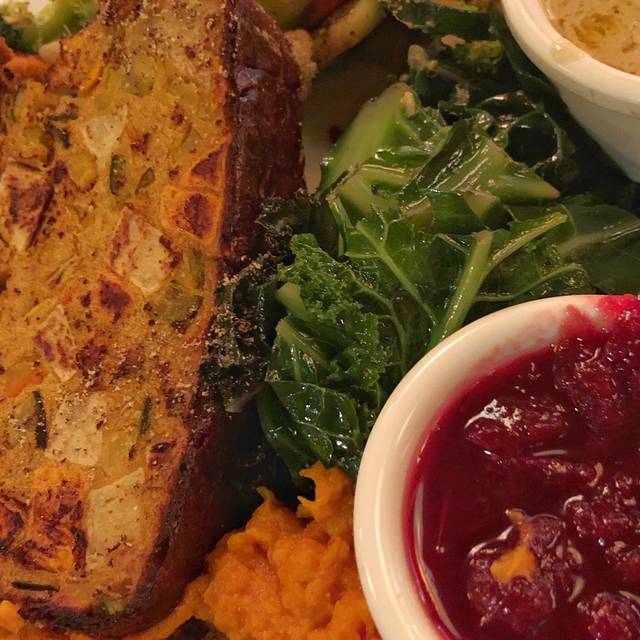 Hugo's is the place to go for healthy Vegan and Gluten Free comfort food. From the appetizers to the desserts, you will find delicious and unique items to satisfy upiy hunger without going off your allergy-conscious diet. The fruit cobbler is amazing! I had a great lunch at Hugo's recently. My friend suggested a dish that had poached eggs on top of potato pancakes. It was fabulous! The pancakes were crispy on the outside and moist on the inside and the eggs were perfectly done! My friend had a stir fry that he loved. I hope I'm in the area soon so I can go again. Very diverse menu. Many healthy choices, comfort food as well. Very good service. For anyone with food allergies or sensitivities this place is a must visit. So nice to go to a restaurant and to be able to have multiple choices for gf, vegan, veg, etc. Great variety and healthy real food. David, our server, was wonderful. He really took care of us. Much appreciated. Great food!! Friendly wonderful place!! This is definitely one of my top "go-to" restaurants. Local, casual, convenient and a lot of healthy choices. But sometimes one cook is better than another. We ordered from a delivery service last week. Items we normally order in the restaurant were just not the same. As an example, the Asian Stir Fry arrived full of jicama and one tiny piece of broccoli. When we dine in, this dish is full of a variety of veggies. When we dined in, recently, on a Saturday night, the food was excellent. Made us scratch our heads wondering why, when delivered, is it not up to par. My huband suggested the reason could simply be - when it is delivered - you are not in the restaurant and so you are likely not to complain or send back. So Hugo's is much better experience if you dine in and not order to be delivered. All my guest had great food. Sadly mine was a little cold and over cooked. Great service and staff. The parking lot is hard to get in and out. Very reliable Hugo's where parties of varying tastes can all walk away happy. Lots of vegetarian and vegan options, but you can also get a very good bacon cheeseburger. Pumpkin pie was probably vegan - different than what you would expect, but still very good. An excellent special on this night was the turkey mole. Tried a regular starter of fried pickles, and they were outstanding. BBQ sauce which accompanied it tasted like it was homemade. Wonderful soups and great breakfast items, many of which are served all day. Love Hugo’s. Good food.. Noidy, but worth the time to go there. Food was cold and seemed to be reheated in the microwave.. Always reliably good food, great service, imaginative specials, customizable options, international foods. Just hard to decide between the strawberry lemonade & the chai lemonade! We like a place with a good variety of menu items. Hugos’s is excellent in that way. My husband can get meat, and my daughter and I have lighter vegan options. Hugo's never fails to have innovative and reliably yummy food. We appreciate the specials and the varied menu options, and the wait staff are always personable. I have been to Hugo's many times because i like that i can build a plate of the items i want. Tonight i ordered same thing and the meal was not good. The only thing i can say i enjoyed was the mashed potatoes. I had ordered salad, brocolini, garlic spinach and two vegan meat balls. I was given 1 1/2 vegie meat balls (ordered two) and called it to the servers attention and she took the half away and never came back with another one before i had pretty much finished the meal. The brocolini was just mostly cut up stems, really not good at all- not tasty, not appetizing, and too crunchy. The garlic spinach side was much smaller and had chunks of garlic that were not good and one was so sharp it hurt my gum. They were really super busy and the server did not get back enough to check on what was going wrong with our meal. It was very frustrating as she was a very nice gal- though she really should have come by more often to see if we needed anything but since they were so busy she did not have much time. My friend liked her salmon, but agreed the brocolini was bad, and she needed more sauce -- but it took a long time to get that sauce, and then they wanted to charge for extra sauce, even though her size dish size was smaller than mine was. I never got another vegie meatball-- though they tried to bring me something that they said they made for me with marinara, even though i did not order marinara vegie ball. The manager didn't seem overly concerned, though she asked what we wanted-- and honestly, i would have preferred a good meal than having to complain about it. They did remove many of the charges for my meal, and gave us a complimentary desert. I had the Shepherd's Pie. It had so much liquid it was like soup. Not nearly enough meat in the "pie". I would not order it again. Enjoyable fresh sourced food with traditional, vegan, or vegetarian options. Nice to find a place that serves tasty healthy food in a casual environment. Dinner was excellent. Food was very fresh prepared well. I would definitely dine here again. Food is really good. Service was so/so. Waiter wasn't attentive. Had to ask for more coffee, come and take our order as well as any refills and to get our check. Great neighborhood place to meet for any meal. Lots of healthy options. Always have a good dining experience here. Always enjoy the healthy choices on the menu at Hugos. Food is good. Service is dependable. Good variety of food. Local Valley Village / Studio City quiet restaurant. Nothing flashy or outstanding but good variety of different cuisines. Good dependable restaurant with plenty of parking. Traveled from all the way in Thousand Oaks because one of my friend recommended it, but we got there and it's was pretty busy. Our waiter took forever to get our orders, the Mac n cheese was horrible. Had to order something else. It was really not what we expected, or maybe if the waiter was more good in customer service, and offering us what was the best in there it would have been better, but I have to say it was not the best food.